Your search for Venture Capital, Private Equity or Angel investor is over… Here’s your opportunity to get the best possible chance available to receive the capital you need -- in the least amount of time. Save precious time and energy and focus on growing your business, not chasing money! Your mind immediately races through all of the dreams and plans you have for your new business or your expansion as you give him your proper business name for the check. But this is just the beginning for you and your new venture. You know you’ve got your work cut out for you but now you have the funds you need to take your business to the next level. What a great feeling! Quite frankly- raising venture capital in the traditional way can be a pain and many requests for venture capital just end up in the garbage. You’ve got a great product or service, you’ve tested and you know that the right people will pay for what you’re offering. You’ve done your homework. Now what you need to do is to stack the deck in your favor to get the capital you need to get your product or service to the people – And that’s exactly how we can help. 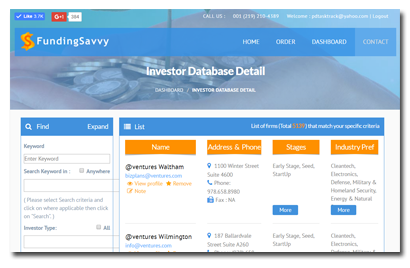 FundingSavvy has compiled a list of more than 5,100 Venture Capital investors, Angel investors and Private Equity Investors over the last ten years – all in one place – and all at your disposal. A team of software developers, internet researchers, and venture capital specialists have worked together to give you the best chance possible to get your new business or your expansion funded quickly and easily. Whether you need capital to launch your new product -- increase sales revenue -- hire employees -- or expand your operations - this easy to use software gives you a comprehensive global database of Venture Capitalists, Angel Investors and Private Equity Investors to meet all of your venture capital needs. 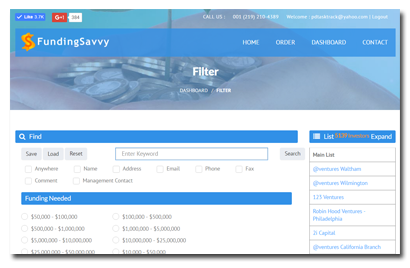 FundingSavvy is a powerful web-based software as a service package with a categorized directory containing contact information for venture capital, private equity, angel investors, and other private investment firms. 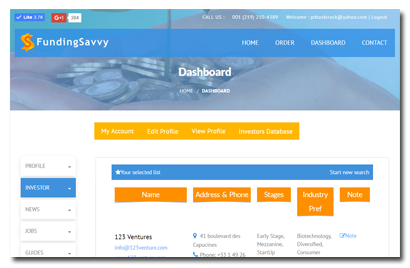 FundingSavvy designed with you, the entrepreneur in mind. 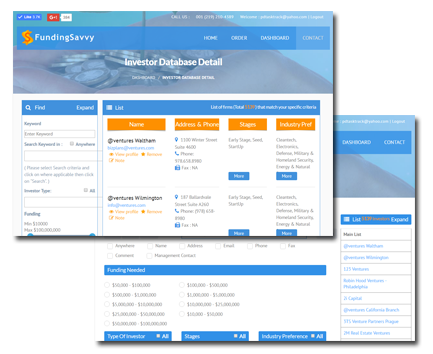 From its user-friendly interface to its powerful back-end database, FundingSavvy will quickly become your most valuable tool for finding the funding you need. Compile a mailing list with as many investors as you wish and e-mail them all with the click of a mouse. One-Click e-mail function Compile a mailing list with as many investors as you wish and e-mail them all with the click of a mouse. Every funding source entry is categorized by Stage Preference, Industry Preference, and Location. Save valuable time by knowing which companies are the best for your business. E-mail selected firms, directly from the software, with the click of a mouse. FundingSavvy has done extensive research to ensure that you get the best venture capital firms and angel investors and that the information is exactly what you desire. We provide contact details for each investor including the firm name, office address, phone, fax, contact e-mail, mailing address, and web site. Find Hard to Find "SECRET INVESTORS" Who Don't Advertise Their Service, only here! Resources – More than 5,100 worldwide funding resources with their contact information. Unlimited Data Searches – Customized for your unique needs. 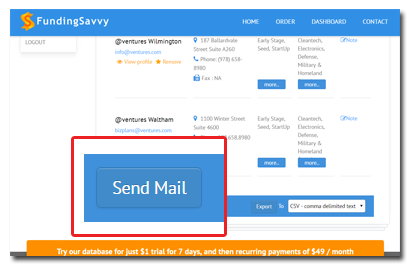 Management Team Members contacts – FundingSavvy includes more than 15,000 Venture Capitalists, management team members, Angel investors, partners including their name, e-mail and phone number. Fund size info – Reveal the fund size and the minimum and maximum amount of capital offered from every investor. One-Click Email – Send your information to your customized list of investors. Contact Management - Maintain your personal investor database. Updates – Allow you to maintain the latest industry data on your computer. Ability to create and edit custom firm lists. Link to investment related sites. And as a registered user, you will also receive one year of FREE updates. …All from your computer or laptop. 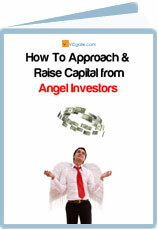 You can blast a letter of introduction to as many investors as you like – any time you like. Just research our database and find the investors that best suit you -- and with our one click emailing you can send your email to all of them -- at once! We Can Help You Get the Venture Capital You Need No Matter What Business You Are In! 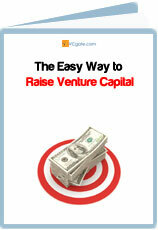 Our goal is to provide you with the best venture capital directory on the market today. Our researchers have verified the quality of all our data entries and continue to maintain its veracity. So you can count on the information we provide to be up to date and accurate… After all - this is what we do. No broken links or investors that have gone out of business. The information that we’ve compiled for you and continually maintain is the work of a dedicated staff of professionals -- with years of experience in putting together investors and entrepreneurs -- locating investors from around the world -- and developing a software product that puts it all together. Being an entrepreneur can be an exciting and an extremely challenging lifestyle. And we know how hard it is to keep your life in balance. Most people I’ve met that run a business work long hours, and like you, are disciplined. You can save yourself a lot of time and some major headaches and focus on building your business with FundingSavvy. With our product you get all of our expertise and experience in a box! We work hard to save you time and money. I could quickly name off another fifty -- both investors and entrepreneurs that we have helped over the years – and you would recognize many of them. Act now and subscribe to this FULL function account with complete investors data for only a $1 startup nominal processing fee and access this incredible more than 5000 Private investors, Angel investors, Private Equity Funds and Venture Capital Firms database for a 7-day trial! As long as you don't decide to cancel within 7 days you will continue to access your FULL account that includes the complete database for only $49 per month. P.S. We have a support team that is available to help you get started the minute you make your purchase. You can contact here: https://www.vcgate.com/support-center/ for any question or need you have. We look forward to having you aboard! Now you have all of the tools you will need to get your business up and running quickly – or get that expansion you need to take your business to the next level. From writing a winning business plan to showcasing your company to more than 5,100 investors with $3 trillion to invest – you’ve stacked the deck in your favor to get funded quickly and easily – and get on with the business of your success! And you get all of this for a one-time payment of just $1! So what are you waiting for – Order Today! P.S. We have a support team that is available to help you get started the minute you make your purchase. You can contact here: https://www.vcgate.com/support-center/ for any question or need you have. We look forward to having you aboard!